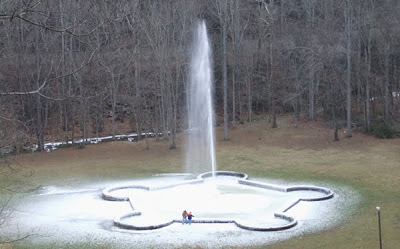 With the wintry temperatures we’re having (what we like to call hot chocolate weather), we were anxious to see how Andrews Geyser looks this first week of 2010. 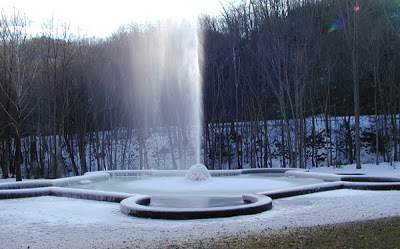 The Andrews Geyser was constructed near Mill Creek in Old Fort, North Carolina in the late 1800s as a memorial to the men who died building the railroad through this part of the North Carolina mountains, and as a fountain feature for a railroad resort called the Round Knob Hotel (which burned down in 1903). The sole reason for the existence of our private property inside Pisgah National Forest was to create a water source for the geyser, located two miles down the mountain. We have the dam and the valve that controls the water flow (neat, huh?). The geyser was relocated just across the creek and refurbished in 1911, then rededicated in 1976 (in a nice coincidence, on the day Innkeeper Brigette was born). The Andrews Geyser now sits in a public park maintained by the town of Old Fort, with the elevated railroad curving beautifully around the fountain as it sprays 80 feet in the air. 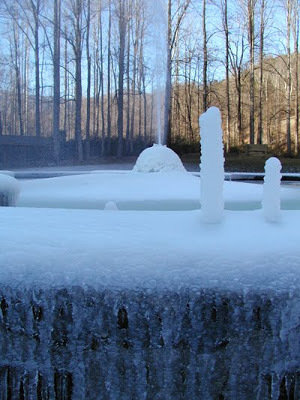 This entry was posted in Uncategorized and tagged guests, Old Fort / Andrews Geyser, Winter by Inn on Mill Creek. Bookmark the permalink.